The famous preacher Rev. Fr. Ejike Mbaka has had a vision about President Buhari. Fr. Mbaka has vision about Buhari, what he saw was terrifying. He said the president’s chances of recovering from ill health could be slim. However, the preacher (Fr. Mbaka) is calling on Nigerians to pray for the president’s recover. The controversial and fiery preacher Rev. Fr. 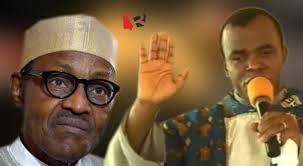 Ejike Mbaka disclosed his recent vision concerning President Muhammadu Buhari’s ailment, Naij Post has reported. He has revealed he is very concerned about the president’s wellbeing and believes he may not survive his illness. However, Mbaka says that with sincere and honest prayer Buhari could pull through and return to normal health. Fr. Mbaka has a long stranding relationship with President Buhari. He also blamed certain individuals for Buhari’s plight as they are determined for Buhari to remain sick. “Such people hate everything about the President,” he said, talking about his vision. When describing his vision to his congregation, he called for prayers in support of Nigeria’s leader. “We call on Michael the arch angel, Uriel the archangel, Gabriel the archangel to carry you in their wings back to life. They angels are bringing you back in their wings,” he said. While concluding the prayer, the prophet said he wants to see the president’s enemies shining and prospering, even if his healing may be little but now with our prayers and faith, the chances of his coming out is high. President Buhari is expected to arrive back in Nigeria today (Sunday).